Most sailing folk in Ireland and abroad will know Dave Cullen as the amiable yet very determined owner-skipper of the immaculately-maintained and precision-campaigned Half Ton Classic Checkmate XV, the current World Champion writes W M Nixon. But if you are anywhere within the orbit of his home club of Howth, you’ll know there’s another side to Dave. He is a formidably successful one-man charitable fund-raising organisation, the highlight of his activities in this area being an annual (and always booked-out) lunch in Howth Yacht Club which sees the Christmas season off to a flying start. 2018’s was held on Friday. And it marked ten years of Dave’s determined staging of this mega-event, with the money raised over the magic decade for various highly-regarded organisations soaring through the €100,000 mark. This time round, the beneficiary was Vincent de Paul for the first time. But Dave spreads the net wide, and other charities which have come within his benevolent scope have included Laura Lynn, the Bobby Bastow Cancer Fund, the Bombolulu Primary School project in Mombasa, St Francis Hospice, and the Joe English Trust. To help him in his good work, he recruits star sporting speakers such as Harry Cudmore, Eddie Warden Owen, Ian Walker, and Isac Boss, while lively auctions are another part of the mix. Everybody has a good time, and at the end of it there’s a substantial donation to the charity of the year. But Dave Cullen’s interest doesn’t stop there – he is known to quietly get on with follow-up support for some of the smaller organisations which have attracted his interest. And as for how to run a show like this and where to source the necessary equipment - as he does it all himself, he is an immediate and generous fount of information for anyone seeking to do the same. The mild Autumn / Winter shows no sign of letting up, with another nice morning for the Howth Lasers again this week. Illness, injury and possibly some early Christmas celebrations depleted the fleet this week, but the competition was still as fierce as ever. With the wind switching around to 245 degrees, we had much flatter seas than last week. Flat out boat speed was essential along with plenty of endurance! Winds ranged from 19 to 27 knots initially for first race. Ronan Wallace started at the committee boat and controlled the fleet throughout the race. Behind him there was a close battle for places 2 to 5 with a very gusty gybe mark causing problems for many. Conor Murphy was unlucky to lose out on 2nd place with a broken outhaul line just at the final leeward mark. Dave Quinn took second and Conor Costello third. The breeze moderated to between 12 and 17 knots for the 2nd race. Dave Quinn lead off the line, but Conor Costello showed some great speed to lead round the first mark. They exchanged places for the next lap before Ronan Wallace took the lead on the second lap with his lightning fast speed on the broad reaches. This was a much tighter race with nothing to separate 2nd to 5th place again right to the finish. It finished with Wallace getting another bullet and Quinn second, with Mike Evans coming through to take 3rd. There are two more weeks to go before the Christmas break, and the Laser flhasave Christmas drinks planned for all competitors after the final race of the Winter Series on Sunday 16th. The annual New Years Day race will also take place this year, with a single race at the slightly later start time of 11:45. All are welcome. In his address to the invited guests at Howth Yacht Club on 23rd November and marking his closing weeks as Commodore of the club, Joe McPeake took the opportunity to share his thoughts on the current position and future possibilities of the sport of sailing in Ireland. The following text is taken from the speech that he gave and presents views that might echo around the Irish sailing scene. ‘Members and special guests are all welcome, as you are all here because each and every one of you has participated in ensuring that this club enjoys a remarkable and successful history, a continuing story which is maintained with your participation in evolving and expanding our core sport of sailing as well as playing a major part in the community. Your contribution and efforts over the years have ensured that today we enjoy this pace-setting organisation with all its state-of-the-art facilities. Optimising our use of these facilities is always HYC’s main objective, and on this I would particularly like to thank all those sponsors who helped ensure that our sailing events were well funded and organised, helping them to achieve their true potential. This week has been a spectacular week from an Irish sporting point of view, when we remember last Saturday’s great victory by the Irish rugby team over the world’s Number Ones –– the All Blacks. Whatever view you take, it certainly showed that we as a nation have the capacity once again to perform way above our weight. It also shows how a sport which - 25 years ago - was a ‘minority exclusive’ sport, has now grown spectacularly through proper planning and strategising, to become one of Ireland’s favourite sports, second only to the great GAA. We in the sailing community face this challenge of building growth today. We need to address the challenges from other sports at a time when the entire country has to keep a cool head when the situation in our nearest neighbour is decidedly un-cool. Presently we are in the midst of the Brexit debate which has reminded us very clearly that we are an island nation. We are surrounded by the sea. But unfortunately, for many decades we have looked inwards, away from the sea. Yet we have incredible natural resources emanating from our coastal waters around Ireland, and not just through fisheries. 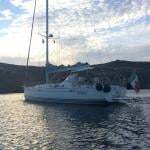 We have spectacular sailing areas incredible diving sites and magnificent sports fishing. We have wonderful beauty along the coastline. We have seen how successful the Wild Atlantic Way campaign has been for tourism. Yet we have not harnessed the greatest asset that we have, which is the ever-present sea’s potential to maximise marine-related sports. Look at our European counterparts - especially France, Spain and Portugal - who totally involve their education and municipal authorities in the whole ethos of sea sports and activities. Children are educated almost from the first days in schools about the sea, and they are trained in boating skills among others as a matter of course. Then we look at Ireland, and realise that sadly, we are way behind in this integration of water-based activities and knowledge into our national life. And does this have serious consequences? It most certainly does. Coming to the end of my two-year term as Commodore of this great club, I am more than ever clear that the existing structures within clubs throughout the country are not sustainable in the long-term. The change in our social makeup involving greater participation from people who were not born in Ireland, and the economic costs of the sport, will (in my view) mean that unless the sport dramatically changes its focus and structure, it will decline. This might sound negative, but unfortunately, it is the reality. The perception of sailing as being exclusive rather than inclusive is widespread within our own community. This is the perception, and inevitably it is taken up within the new Irish community. "This means that the sport needs to fully integrate ‘watercraft’ into the primary and secondary educational system"
Can this negative perception be tackled? Of course, it can. We need to make the sport more accessible to all in the first instance. This means that the sport needs to fully integrate ‘watercraft’ into the primary and secondary educational system. And not only is it a sporting matter, but it is also a safety issue by virtue of the amount of coastline, rivers and lakes that we have. We need through our local authorities to develop a program that involves all of the young people in watercraft courses. In HYC this year, we developed a STEM programme that meant that we had all of the primary schools in the area participate in one-day educational courses. This focused on topics like: the effect of tides, the impact of plastic in the seas, safety and an experience on sailing boats among others. This is only the beginning of a programme that needs to be developed throughout the country to make young people experience the joy and special satisfaction of being on the water. Watercraft and skills need to be developed at a young age within the educational system. "Unless we give young people this opportunity and make it widely available, our sport will continue to attract only small numbers"
Unless we give young people this opportunity and make it widely available, our sport will continue to attract only small numbers. Such relatively small numbers will not be enough to support the sport’s viability in the long term. Yet again, the message is we need to make the sport more inclusive. HYC partners with the ‘Sailing Into Wellness’ program, a superb initiative that uses sailing to help those recovering from addictions. You will see from this video the powerful impact that our sport can provide to help those less fortunate than us. We are active partners with the Sea Scouts and many other clubs and community groups. We are open to partnering with any group that has a common purpose of enjoying water sports. Our governing body Irish Sailing needs to urgently address this fundamental strategy. Performance sailing and international success is very important, but without a nursery of talent, results will not follow. The sport needs to get greater numbers and at a younger age involved in sailing. It needs to be driving a strategy to ensure that all schools and all sailing clubs develop an integrated activity and educational platform. One could look at the Leinster and Munster rugby academies and the development through the schools of their talents. It is at the schools where it starts, and while not everyone will reach the top ranks in competitive sailing, everyone involved will undoubtedly benefit. Without that quantity which generous and genuine inclusivity brings, success will not flourish. We are lucky in Howth to have had, and continue to have, many superb sailors. The club has provided a base for young sailors to get a grounding, with our unique facilities being made available to them. We intend to offer this to far more than heretofore. Nevertheless, to excel they need considerable access to their own special resources allied with their own admirable determination. Yet it is only when they have achieved a certain level – and it’s a very high level too - that any state support kicks in. To reach that level, our club has to do everything it can to help young sailors. You will have seen highlights that some of our talented members and the commitment that they have made and are making. To summarise: Sailing is being challenged. If not addressed, it will suffer and decline. But with an integrated strategy, it has the potential to flourish and grow. It needs the governing body to re-focus, and create a link between the schools and the clubs, and it needs to communicate with its members and potential members. We have made a new start here in Howth. We are developing QUEST, our sailing school open to all. We are integrating with other organisations and clubs such as the Sea Scouts to widen and to provide facilities for those showing the slightest interest to readily experience the joys of watercraft. But locally successful initiatives and ‘piecemeal’ programmes by a few enlightened clubs will not be enough. Our hope is that our aspirations for Howth will be reflected at a national level and all around our coastline. Ultimately, we’re all in this together. Thank you for coming. Thank you for listening. Easterlies were in place again for this weekend’s Laser action in Howth. Unlike last weeks’ pleasant smooth rolling sea, the breeze was stronger and the ebb tide made for a steeper chop which was much harder work. With winds ranging from 17ts to 25kts, there was plenty of action for the rescue boats too, including a dramatic capsize to weather by your author in race 2. An eager fleet tested race committee patience with a general recall in race one, nicely recorded on video by Harry Gallagher. The fleet got away on the second start, with Conor Murphy leading at the first mark followed by Mike Evans and David Quinn. Evans and Quinn got through Murphy on the first lap with Evans establishing a nice lead on the second beat. Ronan Wallace sailed a superb first run to take the lead, which he kept to the finish. Mike Evans finished second with Quinn in third. Wallace led from the start in race 2, with Dan O’Connell not far behind in second throughout the race. Mike Evans and Dave Quinn got tangled at the first weather mark (I was fully to blame after a terrible tack!! ), leaving Daragh Sheridan to sail past the carnage and maintain third place to the finish. Ronan Wallace now has a commanding lead, winning 7 of the 8 races so far, with Dan O’Connell now lying second and Mike Evans in third overall. In the Radial Fleet, Tom Fox continued his string of bullets, winning both races today, from Peter Hassett with 2 seconds. Sophie Kilmartin similarly dominates the 4.7 fleet, discarding a second after another 2 bullets yesterday. Howth Yacht Club is one of the largest and most progressive sailing clubs in Ireland and through its 'Quest Howth' brand the North Dublin club offers a range of dinghy, keelboat and powerboat courses for young people and adults. HYC's experienced management team, safe training environment and low instructor trainees ratios help to ensure a friendly working environment. HYC also provide free lunches, team gear and subsidised instructor training courses. The HYC training programme will run from February until November. The HYC require full time and part time instructors for daytime, evening and weekend work. HYC also requires instructors who are fluent in French, Spanish or German for sailing courses in June. Please download an application form here and email it with your c.v. to [email protected] Applications should be submitted by 25th November. Shortlisted candidates will be invited for interviews in December. The six Saturdays of the KBC Bank Autumn League at Howth Yacht Club experienced some days so perfect that by the time it concluded with the mother of all festive prize-givings last night, everyone had forgotten that somewhere in the series there was one day of little wind with rain and even some fog writes W M Nixon. Yet despite the conditions, that particular day’s programme was completed. And as for the other five late season Saturdays, they served up an ideal variety of good racing conditions, including days of Autumnal perfection when the sunshine had an almost surreal luminosity. The League’s Organising Chairman Eddie Bourke and his committee knew they were heirs to a well-established sailing tradition, as Howth’s Autumn series was first sailed in rudimentary form in 1979, and will be looking at its 40th Anniversary next year. KBC Bank came aboard as sponsors for 2018, and a core team from the bank, led by Investment Manager David Murphy, joined the party in Howth last night, where the distribution of many trophies was presided over by Commodore Joe McPeake. Bringing such a complex event to its successful traditional conclusion involves multiple factors. And even when everything is properly in place to stage racing on two different course areas, the great imponderable of the Irish weather is the focus of close attention for six weeks in a row. But as the photos reveal, even after the many cloudless days of June and July, the tail end of 2018’s summer still had some strong sunshine left in its locker, and it generously distributed it at Howth through September and October Saturdays. Add to that a good selection of sailing breezes – mostly westerlies – and you have everything in place for the perfect rounding out of one of Howth Yacht Club’s most successful seasons, with boats which had brought HYC success in major national and international events featuring at the head of many classes in the KBC Autumn League. That said, it speaks volumes for the underlying quality of the home fleet that the stars of the national and international scene didn’t always have it their own way during these past six weekends. However, in IRC Class 1 it was a case of repeat and convincing success with Pat Kelly’s J/109 Storm winning overall - her scoreline was 1,3,2,1,1,1 - from the Breen-Hogg team in the First 36.7 Flashback. But IRC 2 was different. Here we had Checkmate XV (Dave Cullen) and Harmony (Johnny Swan), the Howth boats which had been first and second in the Half Ton Classics in Belgium in August, while Checkmate had also been Supreme Champion in the popular Wave Regatta in Howth in June. Yet in the Autumn League, it was another classic Half Tonner, Michael and Richard Evans’ The Big Picture, which emerged as tops, for although she and Checkmate tied on 14 points for the overall IRC Class 2 lead, The Big Picture’s scoreline of 1,1,3, 2, 1 and 6 included more firsts, so she shaded it with Checkmate second, Nigel Biggs’ Checkmate XVII third, Harmony fourth and Stephen Quinn’s J/97 Lambay Rules fifth in a ferociously competitive class which also included the Howth-based J/80s, where Robert Dix in Jeannie won from Dan O’Grady in Jammy. IRC Class 3 had a fascinating lineup, as it included Afloat.ie “Sailor of the Year” Conor Fogerty racing his pet boat, the vintage Silver Shamrock which was World Half Ton Champion under the command of Harold Cudmore at Trieste in 1976. The news is Silver Shamrock still has winning ways, as she took IRC 3 in convincing style with a score of 1,4,3,1,2,3,2 to have 12.0 pts to the 14.5 of Insider (S & D Mullaney) and the 17.0 of Vincent Gaffney’s Laser 28 Alliance II. IRC Classes 4 and 5 were the non-spinnaker divisions, with Stephen Harris and Frank Hughes’ First 40.7 Tiger winning IRC 4 by one point from Colm Bermingham’s Elan 33 Bite the Bullet, third slot going to Dermot Shekan’s Castro-designed Toughnut. IRC 5 saw another vintage Shamrock win, with Steff Ennis & Windsor Lauden taking first with their Club Shamrock Demelza, while second place went to Terry McCoy of Skerries with First 38 Out & About, third going to Gordon Knaggs with the First 32 Jokers Wild. In the three One-Design classes, the slowly-reviving Squibs mustered eight starters, with Fantome (R MacDonnell) winning overall with 12.6 points to the 15 of Derek Bothwell’s Tears in Heaven, with Fergus O’Kelly on the Taste of Racing scheme with Aurora coming third on 21. The Puppeteer 22s had the best turnout of the ODs, with 15 boats coming to the line. Algy Pearson and Alan Blay with Trick or Treat were in sparkling form, discarding a fourth to finish with a scoreline of 1,4,1,1,1,1 to give them just 9 points to the 14 of Scorie Walls in Gold Dust, with Andrew and Robin Hegarty’s Eclipse taking third on 19, the same points as Neil Murphy’s Yellow Peril but the Peril was eclipsed, as you might say, on the countback, and the Hegartys were declared third. 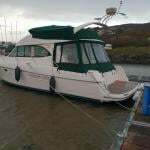 The venerable Howth 17s had a regular turnout of fourteen boats for the entire series, a miraculous recovery from the damage wreaked on them in their winter storage shed by Storm Emma at the beginning of March. And the class is in great racing heart, for although Deilginis (Massey family & Mikey Toomey went into the last race with the series already won, it was done by steadiness through nearly always being in the top ten, for in this seven race series, each race was won by a different Seventeen. Nevertheless Deilginis’s scoreline of a discarded 5, followed by3,2,2,2,1,3, put her on 13 pts to the 17 of Rita (Marc Lynch and John Curley, while Peter Courtney was third on 27 with Oona, and Brian & Conor Turvey were fourth with Isobel on 28, level on points with Ian Malcolm’s Aura, but winning on countback. Next up on the Howth agenda is the Brass Monkeys series for cruisers, starting on Sunday November 4th when there’ll also be the first race of the annual Laser Frostbite Winter Series, which dates all the way back to 1974. But for now, memories of the fantastic sunshine which blessed much of the KBC Autumn League is a memory to cherish. The Kelly family's 'Storm' has won the J109 one design Irish Nationals for the last two years and this weekend the north Dublin crew hope to retain overall honours on home waters as Howth Yacht Club hosts the 2018 championships off Lambay Island. There is a current entry of 11 J109s (two from Howth and nine travelling from Dun Laoghaire). Entries so far for the six-race event are here. The class has secured great support from sponsors: Capitalflow, North Sails Ireland, Bushmills, Porterhouse Brewing Company and UK Sailmakers Ireland; to have a daily prize giving and race winners, in addition to the overall prizes on Sunday. On Saturday evening after racing, HYC has organised a free BBQ for all competitors (compliments to Capitalflow sponsor) and a short de-brief on the racing from North Sails. Weather conditions for the first race of Howth Yacht Club's KBC Autumn League provided a gentle start for the 600 sailors competing in the eight classes on Saturday afternoon. Light winds and warm temperatures prevailed for much of the day, reminiscent of many previous years and the first day of the six-week series that always promises more challenging wind and sea-states. The southerly/south-westerly wind rarely gusted more than 11 knots after it had weaved its way through the Dublin Mountains, across Dublin Bay, around Howth Peninsula and then brushing across the flat and sparkling waters of the two race courses. The race management teams had indicated onshore that racing would be round-the-cans this week and most classes enjoyed a 2-hour race in the gentle but somewhat shifty conditions. In class 1, Don Breen and Paddy Gregory’s team on 'Flashback' read the conditions perfectly, finishing ahead of the chasing J109s led by Simon Knowles and Colm Buckley’s 'Indian' and 2018’s all-conquering ‘Storm’. A move by event organisers not to change pre-existing splits between the cruisers classes meant that class 2 is the largest fleet with 21 boats on their start line and creates internal rivalries including those between the Half-Tonners, X-302s and Corbys. As with many of the competing boats, the Autumn League allows teams to utilise a near-complete season of racing experience to demonstrate the very best of teamwork and refined skills. This might suggest that the regularly raced boats would come to the fore, and indeed they did, with Michael and Richard Evans’s Half-Tonner 'The Big Picture' winning both IRC and ECHO races - taking ‘first blood’ in the series. Winning the Class 3 division will be no easy matter either, with two K25 teams, Conor Fogerty’s classic ‘Silver Shamrock’, Vince Gaffney’s ‘Alliance II’ to name but a few, all on form and vying for contention. However, it was to be ‘Silver Shamrock’s’ day, winning by 2 minutes from the K25 team on ‘Kilcullen’ and doing the ‘double’ with a win on ECHO also. The Non Spinnaker divisions are split between Class 4 and Class 5 and it was to be the Harris/Hughes team on their Beneteau 40.7 ‘Tiger’ that used the conditions to best advantage in Class 4, ahead of the well-sailed Sigma 38 ‘Spellbound’ which won on ECHO and the always-contending ‘Bite the Bullet’. Boats in Class 5 will have to be up early to get ahead of Windsor and Steffi’s Club Shamrock ‘Demelza’, the 1979 classic won both IRC and ECHO races. A change in dynamics in Howth’s one-design classes might suggest that the often cyclical changes in the number of boats racing is again at play, with a reduced-size Puppeteer class balanced by a re-emerging Squib class and the ever-vibrant Howth Seventeens. A familiar pairing of red Puppeteers topped their fleet this week, with Trick or Treat followed over the finish line 25 seconds later by Dave Clarke and Liam Egan’s ‘Harlequin’. Frank Dillon replicated his form in the handicap division by steering ‘Flycatcher’ to victory. Six of the eight entered Squibs raced and former Commodore Derek Bothwell secured the first win for his boat ‘Tears in Heaven’ and the handicap race was won by ‘Absolutely Fabulous’. Derek also gave his other Squib (‘Aurora’) to the Taste of Racing project for this event and Fergus O’Kelly is bringing some of this year’s graduates racing on it for the series. The light winds suited Marcus Lynch and John Curley in their Howth Seventeen ‘Rita’ and second placed ‘Aura’ (Ian Malcolm) whose 120-year-old boats showed a clean pair of heels to the rest of the fleet from the first windward mark. The Seventeen’s unique handicapping system is designed to ensure that those boats that have difficulty competing on scratch will exclusively win the handicap prizes. Tom Houlihan’s ‘Zaida’ won this week’s race. "the cruiser racing classes are invited to take part in an ORC trial which is being run alongside the other divisions"
This year the cruiser racing classes are invited to take part in an ORC trial which is being run alongside the other divisions. Interested teams can still sign up by forwarding their IRC certs so that their measurements can be incorporated in this trial rating. Event sponsors KBC Bank provided a colourful backdrop to the day and they will be presenting prizes to this week’s winners after racing next Saturday. The apres sail party is complemented each week by drinks promotions and live music. The club also provided a delicious range of (free) tapas to competitors when they came ashore. With a convincing win in the final spectacular race run in glorious sunshine and big seas off Nieuwpoort, Checkmate XV (1985 Humphreys) and her crew of owner David Cullen, Darragh O'Connor, Nin O'Leary, Jonathan Sargent, Aidan Beggan, Niki Potterton and Franz Rothschild of Howth Yacht Club claimed a well deserved overall victory in the 2018 Half Ton Classics Cup. For Checkmate XV this was the third time she had earnt the right to have her name engraved on the Half Ton Classics Cup (equalling the legendary Swuzzlebubble's record) and for David and his team is was their second win, the first also being here in Nieuwpoort in 2015 as Afloat.ie reported here. In a unique one-two for Ireland, Cullen's clubmate Jonny Swann in Harmony took second overall, to underline the high standard of Half-Ton racing in Ireland at the moment. The final race was a cracker, sailed in a 14-16 knot westerly, huge seas and glorious sunshine. The first start was recalled so Race Officer Paul Charlier pulled out the U Flag and on the second attempt, everyone behaved. It was nip and tuck all the way with Robbie Tregear's Per Elisa (1992 Ceccarelli) initially heading the fleet from Philippe Pilate's General Tapioca (1978 Berret), Checkmate XV, Toni Stoschek & Janne Tukolas' Superhero (1988 Andrieu), Tom Florizoone's Red Cloud (1981 Joubert), Paul Wayte's Headhunter (1984 Van de Stadt) and Jonny Swan's Harmony (1980 Humphreys). But the Irish team dug deep and by the final turn for home Checkmate XV had a decent lead with Per Elisa, Harmony and General Tapioca now hard on her heels. At the finish Checkmate XV took the race by 52 seconds, with Harmony second from Per Elisa and General Tapioca fourth. Sadly a technical issue with the committee boat's anchor made a second race impossible and so the championship closed with eight races completed. In his thank you speech at the prize giving David Cullen made a few special presentations of his own before reflecting that "Being a Half-Ton owner is a bit like being a heroin addict, you don't really enjoy it but its very hard to stop! And a lot of that comes down to the camaraderie in this room and in this class." It was a sentiment that clearly hit the right note with the assembled crowd and he then went on to particularly thank Class Chairman Philippe Pilate and Class Secretary Bert Janssen for all their work in driving and supporting the Class. "Being a Half-Ton owner is a bit like being a heroin addict, you don't really enjoy it but it's very hard to stop!" In the Vintage IOR Division, Albert Pierrard & An Callens' A+ (1985 Nissen) had a superb last race loving every minute of the downwind sleigh rides, with Waverider second by 47 seconds and Nicolas Lejeune's Skippy's Ton (1984 Briand) third. At the Prize Giving it was confirmed that the first ever winner of the new Vintage IOR Trophy was the local Belgian boat Waverider sailed by owner Jaques Lemaire, Michael Gendebien, Thibout de Kenchous, Michel Lefebure, Stephove Putseys, Winnie Berteloot and Pascal Aboosha. Ivan Van Burm's Fantasy (1980 Humphreys) took second place by a mere half point from A+ in third. The final prize presented is always the Spirit of Half Ton Trophy and it goes to the team who best embody that certain hard to define something that sums up the true heart of the Half Ton Class. For rescuing and totally rebuilding their boat against all the odds after she was almost completely destroyed when a crane fell on her some three years ago, this year the Spirit of Half Ton Trophy was presented to Nicolas Lejeune and Waverider. Waverider is a truly special Half Tonner; designed by Laurie Davidson in 1977 she won two consecutive Half Ton Cups in 1978 off Poole and in 1979 off Scheveningen. Her reconstruction has been a work of love and dedication by Nicolas and his friends and family, with the support of boat builders and fellow Half Ton sailors Tom Florizoone (Red Cloud) and Ian Van Burm (Fantasy). Waverider is a wooden boat so first she had to be put into a jig and left to settle back into shape before the rebuild could start. That work could only begin a few months ago and took the team until the night before the regatta to complete. The very first time the sailed the boat after her relaunch was the first race of this championship, so this was a hugely popular win and the entire team came to the stage to raucous cheers and applause.